Continued from Stage 21 - page 1. There are many statues within the cathedral but one of particular interest is the Virgen de los Dados (or the Virgin of the Die or Dice). The legend tells of a captain of the Tercios de Flandes who went to eat in one of the numerous taverns in the Calle de la Bodega Vieja (now known as Calle Mariano Dominguez Berrueta). After having a large meal and plenty of wine to drink he started to talk about the numerous battles he had been in and generally telling a few tall stories and after while, fuelled by the copious amounts of alcohol he had consumed, he started to gamble. Unfortunately, the alcohol was having a detrimental affect on him and he began to gamble irresponsibly losing quite a lot of money, but this didn't seem to stop him as he thought he could recoup the money he lost if he continued to play. This continued most of the night until he saw that he no longer had any money to bet with and anguished by the loss of his money he left in a huff. Wandering the streets of Leon at night he began cursing the bad luck the dice had brought him until he came upon the statue of the Virgin and child at the north wall of the cathedral. He hoped that by looking upon the figure of the Virgin that he would get some sort of peace but quite the opposite happened. In a fit of pique he threw the dice towards the Virgin hitting the head of the Christ child. At that very moment blood sprang forth from the wound and the poor Captain felt a chill go through his body and he fell to his knees begging forgiveness for what he had done staying there until dawn. A few days later the man presented himself to the local Franciscan monastery just outside the walls of Leon. After explaining what he had done he entered the monastery never to leave, living the rest of his life as a Franciscan monk. The story of what had happened soon spread around the city and the statue has been known from that day hence as the Virgen de los Dados. The council of the Cathedral, fearing that this might happen again decided to bring the Virgin into the cathedral where it can be found today with her hand outstretched as if to say that she is willing to receive the dice of any person displeased by their game. Whilst still in the cathedral it is worth visiting the museum which is housed in the cloisters and sacristy and reached by a beautiful plateresque stairway. 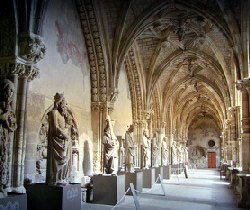 The museum contains many examples of religious art as well as the tombs and statues of much of Leon's nobility. 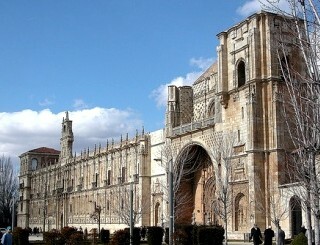 Not far from the cathedral is the Real Colegieta de San Isidoro. This beautiful Romanesque building built partly into the city walls, is one of the most important buildings of its type. 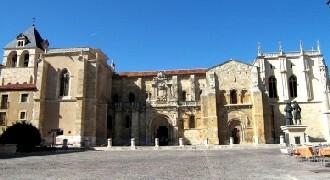 Built over the 10th century remains of a monastery built by Sancho el Gordo it was consecrated in the 11th century. In 1063 King Fernando I named the church after San Isidoro after having repatriated the saint's remains from Muslim held Sevilla. As you look at the building the right hand door is called La Puerta del Perdón or the door of forgiveness. It was believed that any pilgrim who was too ill to continue on their journey to Santiago could gain absolution by passing through this doorway. The other doorway, to your left, is La Puerta del Cordero or door of the lamb. Inside the church below the retablo is the casket which holds the remains of San Isidoro. The real treasure of the basilica is its museum. 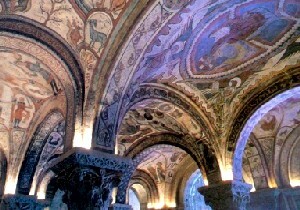 The first area you enter is the royal crypt or Panteón Real with its amazing painted vaulted ceiling. The crypt holds the tombs of 11 of the Kings of Leon and their families, but unfortunately the bodies were taken by the French army during the Napoleonic wars. Towering above the cloisters is the Torre del Gallo or the tower of the cockerel which is topped with an 11th century weathercock. The building that fascinates me is the nearby Casa Botines. This building is by the famous architect Antoni Gaudi, who designed the Sagrada Familia and various other buildings in Barcelona. The building was commissioned by fabric merchants and construction started in 1891 and was declared a historic monument in 1969. For Gaudi this is quite a subdued but rather beautiful building which would not look out of place in a fairy tale. Part of the building houses an exhibition centre with the remaining floors being taken up by a bank. You may be lucky to be allowed to look around but please ask at reception first. 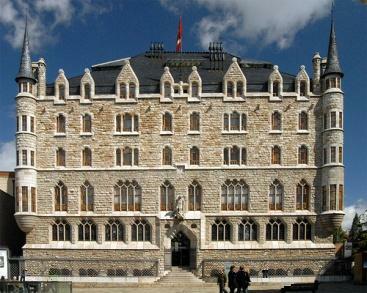 Not too far, near the Plaza Mayor, is the former pilgrim hospital and monastery of San Marcos. The hospital was built under the orders of King Alfonso VII and was in operation from the 12th century through to the 15th century. The present building, with its 100 metre façade was begun in 1515 by the Order of St James who used it as their headquarters. It wasn't completed until some time in the 18th century. 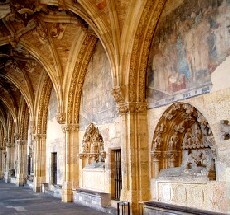 Most of the building is now taken up by a luxurious Parador but the chapterhouse contains an archaeological museum. You can wonder round the ground floor of the Parador if you ask permission first at reception, alternatively you can join one of the regular tours that are put on daily. 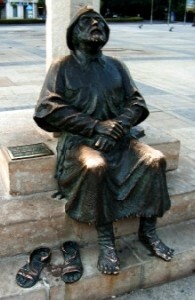 Just across the square there is a statue of a pilgrim looking towards the building. The area to the north of Calle Ancha is an area known as el Barrio Humedo or the wet district said to get its name from the sheer number of bars in this area. There are plenty of places where you can spend the night, from albergues right through to the luxurious parador. There are also plenty of bars, restaurants and cafés. If you want to spend the day here the tourist information office is located opposite the cathedral.